Each month we meet at someone's house for a potluck or at an ethnic restaurant. Restaurants are based on CORVA members' suggestions. Each year the restaurants are a mix of new meeting spots or restaurants members loved so much that want a repeat visit. Potlucks are not where you need to feel obligated to show off your culinary skills (although, we do love the culinary talents of some of our members). They are about getting together to enjoy each others' company and pass on information. *Addresses to members' homes come in an email. Dinner starts at 6:30, except when noted otherwise. Periodically, there are other events and gatherings throughout the year. 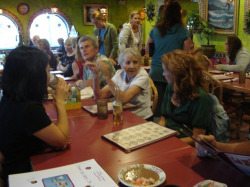 January 21, 2015 @6:30 p.m. Dinner Out El Vaquero restaurant, Olentagy River Rd. March 18, 2015 @ 6:30 p.m Dinner Out: Royal Ginger,1265 W. Lane Avenue, Upper Arlington, OH. Potluck at Ann Nelson's place. The address will come. March 19, 2014 @ 6:30 p.m.
Dinner out Max and Erma's at Polaris. Details to come. We are doing this one as a fundraising event. Potluck at Ben Bloom's and Mary Lee's place. The date needs to be confirmed. December, 7 @ 5 p.m. Annual holiday party, home of Elizabeth Sammons. *note this is a Sunday. Mon., February 25, 2013, 12-3 p.m. OSU Peace Corps Club Open House. Hays Cape Room at Ohio State Student Union. Come meet RPCVS and celebrate OSU's Peace Corps recruiting success. Mon., Feb. 25, 2013, 6.p.m. Dinner Out at Aab Indian Restaurantat 1470 Grandview Ave., Columbus to chat with new Midwest Regional Director Brad Merryman who recently served in Costa Rica after retiring from Sun Microsystems. Happy Hour until 7 p.m. Appetizers are half-price; well drinks, $3; wine and martinis are $4 and beer $2 to $3. Wednesday, April, 17 2013 @ 6:30 p.m.
Potluck at Carol and Michael Kirwin's. Wed., July 17, 2013 @ 6:30 p.m..
Dinner out Nasareth Restaurant and Deli 5239 N. Hamilton Rd. Sunday, August 25, 2013@ 5 p.m. Annual meeting picnic/potuck at Peter and Matina Ross's house. This is the last Sunday of August. Wed., Sept. 18, 2013 @ 6:30 p.m..
Wed., Oct. 16, 2013@ 6:30 p.m.
Potluck at Elizabeth Sammons house. Address will be sent in an email. Bring a dish to share. December 2, 2012 @ 5 p.m.
November 14, 2012 @ 6:30 p.m.
Fri. April 24@ 6-8 Party for new Peace Corps recruits who have been accepted. At the Ag Administration Bldg. Auditorium at OSU. Chinese Buffet restaurant. Evite coming. 6:30 PM. Come celebrate Peace Corps and the OSU community by marching with CORVA members, and Peace Corps Applicants who have been invited to serve, in the Ohio State Homecoming Parade. Parade goes from OSU Stadium down Lane Ave. to the Ohio Student Union on High Street. Don't know where to park? Meet at 6:00 PM at the west side of the stadium. Look for the Peace Corps banner – Parade starts at 6:00 PM﻿ but Peace Corps is towards the end of the line up so it takes awhile to move. Wed. Feb. 15, 2017. Potluck at Ann Nelson's house. Details coming in Evite. Bring appetizers or something else to share. June 17, 2017 - March in Gay Pride Parade with CORVA and Peace Corps. Meet downtown Columbus at 10 a.m. for parade line-up. Look for the Peace Corps banner with Danny Livengood, the Peace Corps recruiter for Central Ohio. Jamie Rhein, CORVA's president will be there as well. 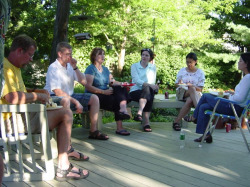 June 21: Summer Bash CORVAPotluck at Pete Wilms (Check EVITE). Starts at 6:30. Bring a dish to share. Along with meeting once a month, CORVA members sell watermelon in June at ComFEST, Columbus's largest arts and music festival, and run a booth at the International Festival in November. Check out CORVA's 2011 activities that celebrated the 50th anniversary of Peace Corps. Click here.